ACMIT has had the opportunity to present results from R&D activities at several national and international conferences taking place this autumn. ACMIT partner HandInScan Ltd. showcased its new product – the Hand-in-Scan Medical Trainer last week at MEDICA. More than 40.000 persons in Austria are confronted with the diagnosis of “cancer” every year. in Shanghai/China, from September 18-20, 2014. 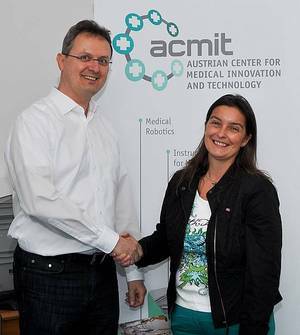 The ACMIT partner „Antal Bejczy Center for Intelligent Robotics“ at Óbuda University (Budapest, Hungary) received a daVinci surgical system for new cutting-edge research in the field of medical robotics. In early July, the new Central European Living Lab for Intelligent Robotics (CELLI) has been constituted in a meeting in Tihany, Hungary. The original idea for CELLI is to serve as a user-centered, open-innovation ecosystem, integrating concurrent research and innovation processes within a public–private–people partnership. ACMIT has relaunched its website www.acmit.at on July 1, 2014. „Science Day“ is an educational initiative supported by the regional government to get 16-19 year old students into natural sciences and technology. 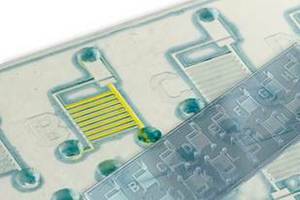 The Austrian Center for Medical Innovation and Technology ACMIT will be present at Medizin Innovativ – MedTech Pharma 2014 from 2-3 July in Nuremberg. ACMIT took part in „Lange Nacht der Forschung 2014“ on April 4th 2014. As of April 1st, 2014, the company name „Integrated Microsystems Austria GmbH“ has been renamed to „ACMIT Gmbh“. The Karl Landsteiner University of Health Sciences signed a partnership agreement with ACMIT today. The private university, located in Krems / Lower Austria, now joins ACMIT’s international network of renowned scientific partners.